There are times in our lives when we know that our inspirations are coming from something beyond the personality. These visions come from a land beyond the physical, even beyond words. They are concepts we have no words for, we have only our inner knowing. The personality moves over and we find ourselves relying upon something beyond the five senses, or sheer logic. Perhaps that ‘sixth sense’ is the emerging force, which is the next step in the evolution of the human race. A developing being knows it is no longer appropriate to depend only upon the physical world. This being will develop the skills it needs to see and feel and work within the unseen territory of the soul. Once we acknowledge the souls’ existence and approach it with respect and sacredness, the personality becomes aligned with the soul. With this alignment comes respect for all life, and many difficulties usually experienced with the unconscious personality can be avoided. When our soul becomes directly involved with the physical world, we greet each day with the deepest part of ourselves, and all activities become gratifying and purposeful. It is the gratitude that we give each day that gets us off the karmic wheel of debts, because we now see the Sacredness of All Life. I have much to be grateful for. 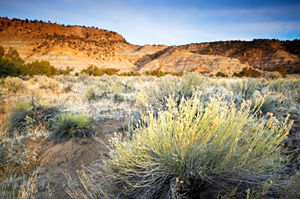 The desert’s barrenness, along with the mountains’ majesty, stripped me of my ego long enough to allow the healing forces of the sagebrush to greet my soul. Sage has healed my physical body during illness, my emotional and mental bodies during depressions and confusion, and it has healed my soul of desolation. The spirits of the mountains have been my soulmates. This is why I am called Mountain Sage. I can only truthfully share from my personal experiences that which I have learned, and I hope this will help to open the door to many other anxious souls.